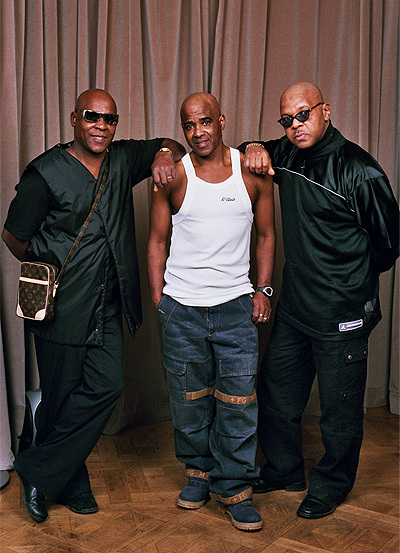 ..:: ARMIN RAHN - Agency & Management - The Real Thing ::..
Three original vocalists, Chris Amoo, Eddie Amoo and Dave Smith, who had three million selling hit singles in the 70s, “You To Me Are Everything”, “Can’t Get By Without You” and “Feel The Force”, plus other top ten successes, such as “You’ll Never Know What You’re Missing” and “Whenever You Want My Love”. In 1986 “You To Me Are Everything”, “Can’t Get By Without You” and “Can You Feel The Force” were all remixed and became huge hits again, thanks to their huge club following. “Children Of The Ghetto”, another classic Amoo brothers’ composition, has been covered worldwide by artistes as diverse as Phillip Bailey (of Earth, Wind and Fire) on the Chinese Wall album, Courtney Pine on his Journey To The Urge Within album and The Swingle Singers Live At Ronnie Scott’s. The song was also featured in the Spike Lee movie ‘Clockers’. To quote from the Guinness Book of Hit Records “they were the UKs best selling black group of the late 1970s and only fellow Liverpudlians, The Beatles and Frankie Goes To Hollywood, have had more singles in the all time top 100”. Still going strong in the 21st Century, The Real Thing have definitely earned their reputation as the UKs No. 1 soul band. Eight on stage, performance includes all their top ten hits, plus a medley of classic covers from Kool & The Gang “Ladies Night” and “Celebration”, “Good Times” by Chic and from McFadden & Whitehead “Ain’t No Stopping Us Now”, or for club dates the vocalists can perform independently on playback singing live vocals over backing tracks, and in this respect they have definitely earned the reputation of the best live playback act you can possibly hope to book.